Catholic Church Now Formally Opposes Death Penalty In All Cases It's a shift for the church, which used to consider the death penalty an "acceptable, albeit extreme, means of safeguarding the common good" in response to certain crimes. 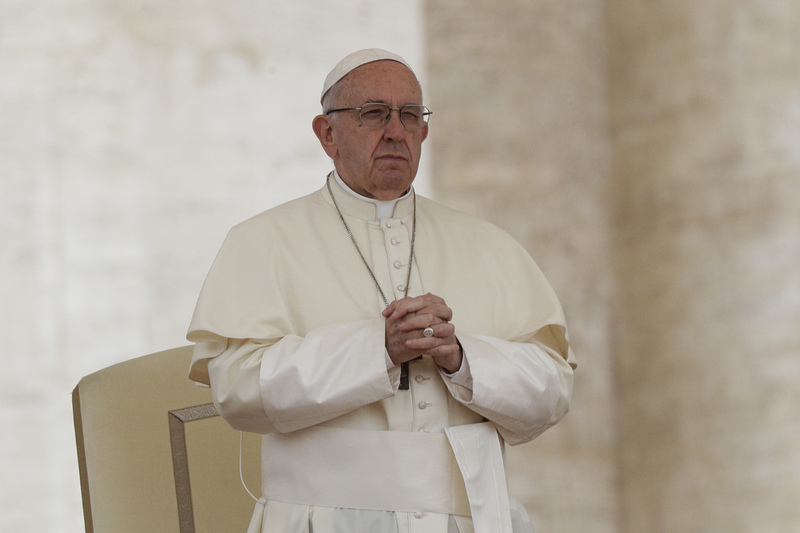 Pope Francis, shown here in May, has previously spoken out against the death penalty. Pope Francis approved the change, which aligns with his public statements against the death penalty. "Recourse to the death penalty on the part of legitimate authority, following a fair trial, was long considered an appropriate response to the gravity of certain crimes and an acceptable, albeit extreme, means of safeguarding the common good," the new teaching reads. Now, it states that "there is an increasing awareness that the dignity of the person is not lost even after the commission of very serious crimes." The Vatican catechism also cited "a new understanding has emerged of the significance of penal sanctions imposed by the state." It also notes that "more effective systems of detention have been developed, which ensure the due protection of citizens but, at the same time, do not definitively deprive the guilty of the possibility of redemption." Over the past decades, Catholic leaders appear to have grown less comfortable with selectively supporting the death penalty. In a letter to bishops about the revision, Cardinal Luis Ladaria, the prefect of the Congregation for the Doctrine of the Faith, noted that Francis' predecessors spoke critically about the death penalty. Ladaria said the change "centers principally on the clearer awareness of the Church for the respect due to every human life." For example, in 1995, Pope John Paul II said, "There is evidence of a growing public opposition to the death penalty, even when such a penalty is seen as a kind of 'legitimate defence' on the part of society." He described that as a sign of hope. And, as Ladaria notes, Pope Benedict XVI called for "the attention of society's leaders to the need to make every effort to eliminate the death penalty." The change also reflects Francis' focus on prisons — as The Associated Press notes, he has "long made prison ministry a mainstay of his vocation." He regularly visits inmates. Last year, there were "993 executions in 23 countries," according to Amnesty International. That's down 4 percent from the previous year. Reporting from Rome, NPR's Sylvia Poggioli says the catechism change is "likely to be opposed by Catholics in the U.S. and other states where capital punishment is legal." The pope also recently stressed the idea of individual dignity in a tweet that appeared critical of the Trump administration's policy of separating migrant children from their families, as NPR's Amy Held reported. "A person's dignity does not depend on them being a citizen, a migrant, or a refugee," he wrote last month. "Saving the life of someone fleeing war and poverty is an act of humanity."